The Big Wobble: Kilometers of coastline covered in dead fish Just north of Brisbane Australia: Another mass die off leaving experts scratching their heads! Kilometers of coastline covered in dead fish Just north of Brisbane Australia: Another mass die off leaving experts scratching their heads! 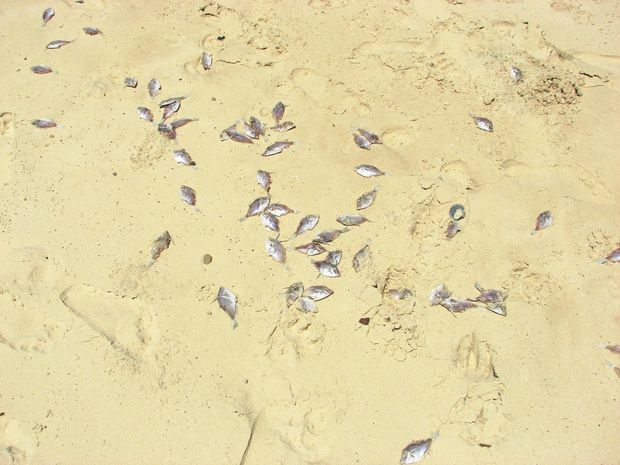 MASS DEATH: Many thousands of fish, thought to be a small species of leatherjacket, have washed up dead along the Cooloola Coast. After a week of extreme temperatures of nearly 50C and thousands of dead bats dropping from trees because of the extreme temperatures in parts of New South Wales and record rainfall in Sydney another disaster has unfolded along the Cooloola Coast as thousands of dead fish were reported to Department of Environment and Heritage Protection between Teewah and Double Island Point. Once again no one has a clue as to why thousands of fish have washed up dead along kilometers of the Cooloola Coast. And thousands more have been reported to The Gympie Times as lining the tide line along more than 1km at Rainbow Beach. Queensland Parks and Wildlife Service rangers from Rainbow Beach had also noted dead fish during their beach patrols, an EHP representative said on Friday. The representative said the department had received two reports so far through its pollution hotline, involving large numbers of fish between Teewah and DIP. Rainbow Beach resident Ian Giesemann, who supplied the photograph (above), said they looked like leatherjackets, an assessment confirmed by Tin Can Bay fisher Joe McLeod. "They are a small species of leatherjacket that often gather in dense schools, sometimes in plague proportions and die. "They are also a common trawler by-catch fish. They float when they die and sometimes wash up. "It often happens on Fraser Island," he said. "There would be about 10,000 fish washed up on one 800m stretch alone," Mr. Giesemann said. "There were about 10 to 15 fish (about 100mm or a bit larger) a meter," he said. The EHP representative said fisheries officers had taken part in joint investigations with EHP and it seemed they might be trawler by-catch. "As in this case, the fish have mostly washed up over a large, relatively uninhabited area, the fish will be left to decompose naturally," the department representative said.